What boards are good to bring to G-Land? Here is my quiver I used in 2009 all season in the G-Land Surf. For G-Land I usually ride 2" to 8" bigger depending on the conditions. Bringing 3 boards is a great idea to cover for the different wave sizes and incase you break a board. Above is a 6'2, 6'4 and 6'7. The 6'2 I would surf in 3-4ft waves (up to a bit overhead), the 6'4 in 4-6ft (overhead to double overhead), and my 6'7 is great for 5-8ft (double overhead+). I also surfed a couple of longer boards. On some of the really big days I rode a 7'8. If you are not really fit it helps to have a board in the 7ft range. It's certainly not a bad thing having to much length at G-Land. The waves in G-Land have more power than most waves, and you will find you'll want the extra length, a little bit extra volume, and a strong glass job is recommended. I ride Keahana Epoxy boards, they last really well and are near unbreakable. What wetsuits etc are needed in G-Land? G-Land can get cooler currents especially during July and August. During the early season it is super warm water, where you can wear boardshorts and be comfortable, but come June it often starts cooling off a bit. Bring a spring suit to be safe, or a wetsuit jacket at least. Not only will the neoprene keep you warmer if the water is cooler, but it will give you reef protection if you happen to hit the coral reef. Wearing a Gath helmet is not a bad idea if you have one, especially if you plan charging bigger waves and barrels. In the photo above I am wearing a springsuit (with boardies overtop), 1mm reef booties and a gath helmet. I don't wear my Gath often, although for Speedies I quite often will as it can be very shallow, and this part of the G-Land surf reef has alot of power. Booties are a personal preference, but I recommend you bring a pair. At high tide you can get away with paddling most of the way without walking on reef, but the tide can drop fast then your left with a long walk across unforgiving reef. Coming in and out of the G-Land surf at low tide can be very difficult without booties, and falling off you will be thankful to have the booties on to plant your feet on the reef. Booties can save cuts to the feet, and cuts to the feet are the worst for getting infected. Don't like the super-grip that booties gives and can't move your feet? Well just do a really mediocre wax job. Don't even re-wax before surfs, have the minimum amount of wax, and the booties will move easier up and down the board, yet still grip enough not to slip off. Also make sure you get the right size and the low cut thin ones. 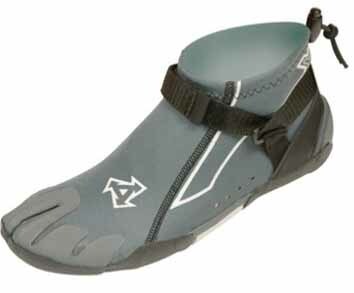 The XCEL 1mm reef booties pictured above are my choice, they are really good. What to bring to G-Land? * 3 surfboards (all rounder, mini-gun, gun). Or at least 2 boards. * We do have good ding repairers in G-Land who can fix snaps and creases, but of course you need a board while its getting fixed. * Neoprene. Springsuit, short-john, wetsuit vest/jacket are good options. * Sun Protection: Good sunblock, zinc, even surfing hats and sunglasses. The glare gets really bad in the afternoons. * Legropes, at least 2, including a longer bigger wave leash. * Small money for any random purchases, ding repairs, laundry, etc. Note we do have credit card facilities in camp also. Is there Malaria in G-Land? G-Land is not well known for having Malaria. I have never taken any anti-malaria pills, and I've been bitten by many mosquito's there over the years. Of course it is not 100% that there is no malaria or such, any where in Indonesia there is that small chance you could get something. Typically from June to September there is hardly any mosquito's even around. But March, April, May, October & November can have more mosquito's due to the extra rain then. All rooms have mosquito nets surrounding the beds, so you can sleep in peace. For sure it is good to use insect repellant, and wear long sleeves and pants in the mornings and evenings. But in the middle of the dry season it really isn't an issue. G-Land is nothing like Lombok & Sumbawa & Mentawai's where malaria is common place. What happens in the event of an Injury? 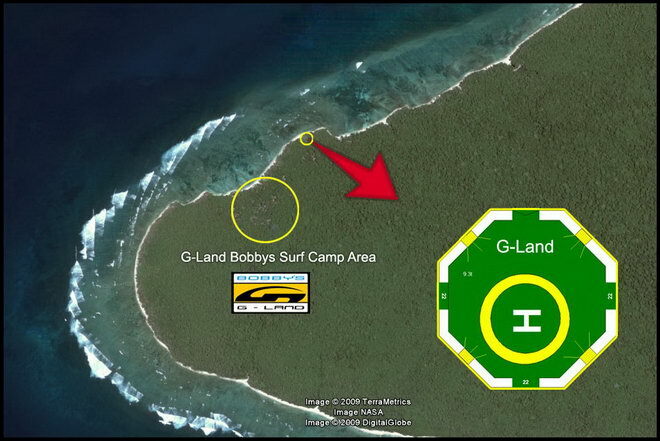 Because G-Land Surf does have some gnarly waves in the likes of Speedies, and it has coral reef, injuries are possible. The most common type is cuts and scrapes from hitting the reef. In our G-Land Surf Camp our manager & spiritual priest, Puma, is highly skilled and experienced at stitching cuts and wounds. We have plenty of medical supplies on hand, and often there is a surfing doctor staying in G-Land too. If the injury is serious such as breaking a bone, dislocating a shoulder, etc, then we have a Helipad. Through your travel insurance we arrange for a helicopter to come and transport you to a western standard hospital in Bali. 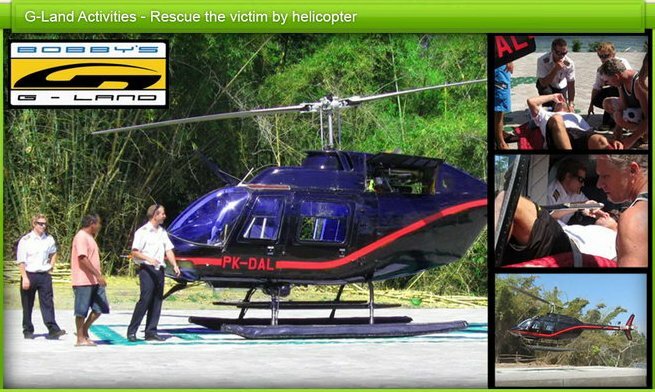 For those who really want to do it in style, for a few thousand dollars they can fly to G-Land by helicopter to go surfing! How is the security in G-Land? G-Land Bobby's Surf Camp has great security. We have a total of 4 security staff who are on the job 24 hours a day. The only people allowed in the camp are guests and staff. In all the superior huts there is a safe for valuables. And we also have a big safe that any guest can put valuables in (passports, money, etc) if they feel the need. Thieving is basically unheard of at Bobby's camp. All your surfboards and gear are totally safe.